Two-player card games, such as Crazy 8's, are not only entertaining to teach kids how to play, but the game also teach them how to be a friendly player of any game. While the primary point is to win a certain game, it is also very important for little kids to know that sometimes it is more than simply about winning or losing. The game begins by dealing each player seven cards and placing the remaining cards in the middle to be used as the draw pile. The first player may play any card in his or her hand down onto the table. The second player then matches either the rank or the suit of that card. For example, if one player plays a 2 of hearts, then a 2 or a card whose rank is hearts may be played. Of course, 8s are wild and can be used anytime. If a player cannot play any card, he or she must pick a card from the draw pile. The first player to empty their hand wins the game. The set up of the game can be somewhat confusing, but is very easy once you know it. Each player is dealt half of a standard deck--26 cards. Two are placed face down side by side. Each player then place five more cards face down next to the two face down cards. Make sure that the two face down cards are on the inside of the five face down cards. Each player then picks up five cards to become their hands and place the remaining cards down next to them as the draw pile. When the game begins, each player flips over the two face down cards and look at their hands. They must play one card from their hands that is either one lower or one higher than the current face up cards. For example, a 6 may be placed on either a 5 or a 7. Players can pick up cards from their draw pile, but they can only keep five cards in their hands as all times. If no move is available, then each player flips over one card from their five face down cards. The game ends when a player has played their hand and draw pile. Each player is dealt half the deck, 26 cards each. Without looking at any cards, both players place four cards face up on the table and identify where a pair exists. 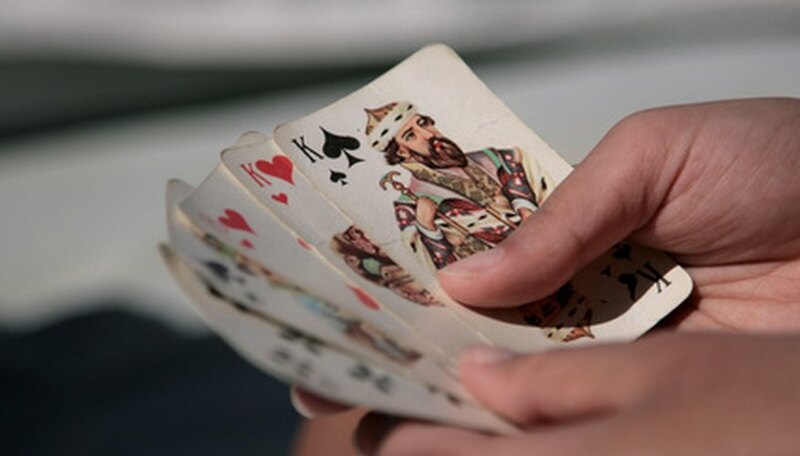 Players can then place cards from their hand on top of the pairs to form new cards. For example, if two queens are available then a player can place one card on each queen. Then the new cards take effects while the queens are no longer in play. At any time, the table should always have eight cards face up. Players can identify pairs at the same time and one player can place a card down on the table. The game ends when a player has successfully played his or her entire hand. Zachary Nguyen is an avid guest writer and editor for a year and a half since 2009. His work appears in three publications at his university, including the weekly newspaper "Argus." He is currently in his third year of pursuing a Bachelor of Arts in mathematics and economics. Nguyen attends Wesleyan University.